The Irish Brigade is rightly regarded as one of the finest units to take the field during the American Civil War. However, just like all other Union formations, they had their ups and down in battle, and like other formations, they suffered from desertion. 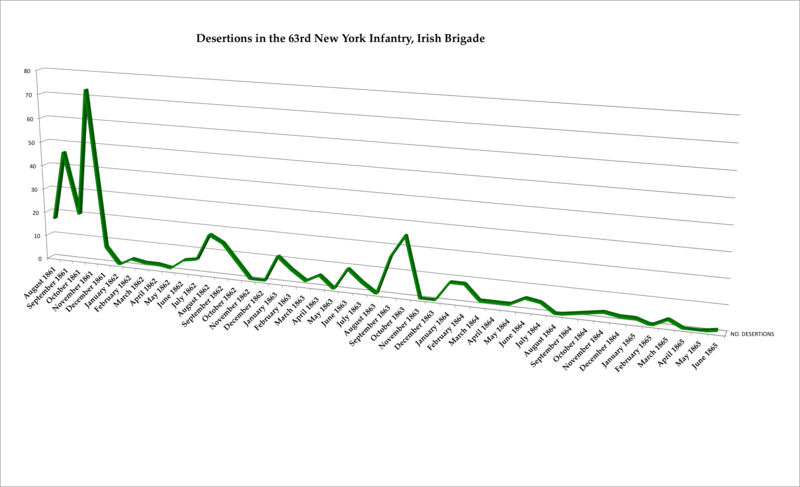 In order to examine this in further detail I have taken the Brigade’s 63rd New York Infantry as a case study, compiling desertion data on the 1,528 men who served in the regiment during the conflict. In the first of a series of posts, I have prepared a number of charts that explore different aspects of desertion in the 63rd. Included among them are the monthly desertions rates in the regiment through the war, with a daily focus on desertion in 1861. Also examined are the locations of desertions, and finally a comparative look at the ages of all the men in the 63rd relative to the ages of those who deserted. 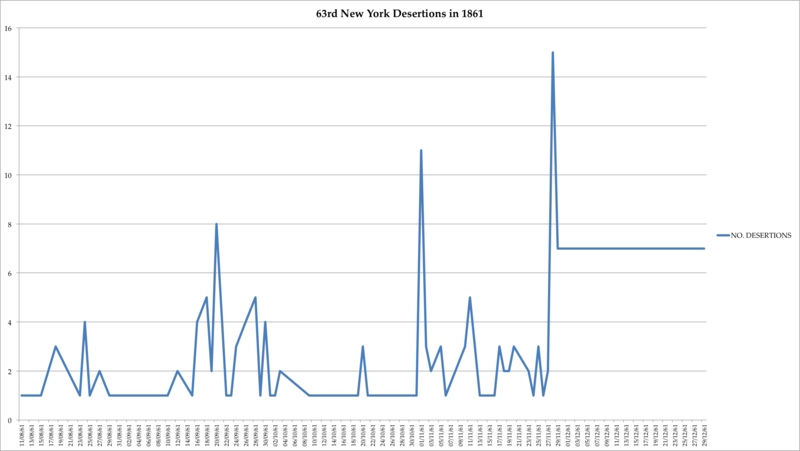 The data on which these charts are based was drawn from the New York Adjutant General roster of the 63rd New York Infantry. Of the 1,528 men listed as serving in the regiment, 368 are recorded as having deserted during the conflict, for a total desertion rate of 24%. The first chart represents the numbers of desertions in the 63rd by month throughout their war service. To examine each of these charts in detail click on the images to enlarge them. Desertion was fundamentally an act that relied upon opportunity. There were large portions of a regiment’s service where it was difficult for men to desert, particularly if their intent was to go home (as opposed to deserting to the enemy). The best time to desert– for men who were so inclined– was when in camp and close to good lines of communication. Better again was to desert before you ever left home, which is what the majority of those who fled from the 63rd New York chose to do. It is interesting to note that despite the fanfare, pride and patriotism that was a hallmark of the formation of the Irish Brigade in 1861, large numbers of men quickly decided that service in the unit wasn’t for them. 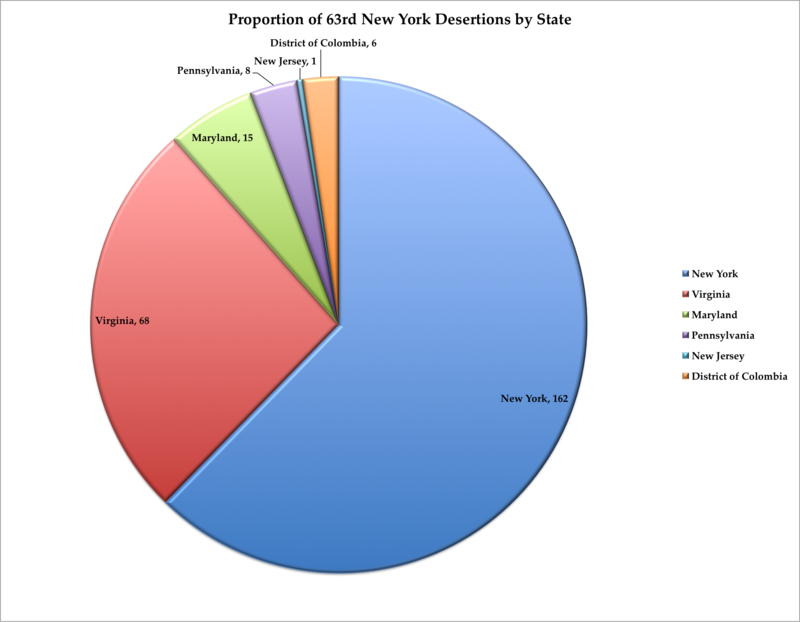 The third chart (above) examines the locations of desertions, organised by State (click the image to enlarge). As pointed out, opportunity was a major factor in desertion, and it is no surprise that the vast bulk of men departed from New York. Though some left while recuperating from wounds or on furlough, the majority of New York deserters after 1861 were new recruits, who only had time to be entered on the rolls before leaving, and so never actually saw active service with the regiment at the front. Some men deserted because they didn’t like the military life, some because of erratic pay, others because they were no longer able to endure the horrors of conflict. As we have seen in a number of pension files, many men were also put under considerable pressure to desert by those at home, be they dependent parents or wives and children. With that in mind we might expect to see a higher proportion of men of likely married age departing the ranks. 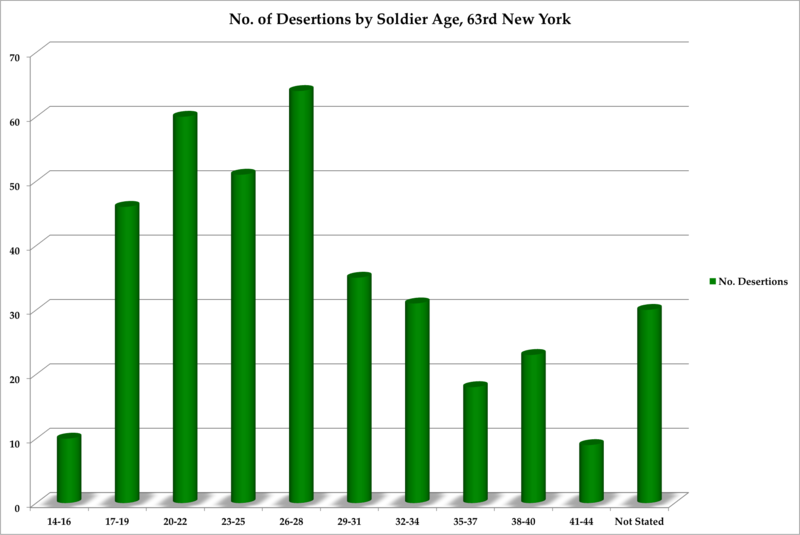 The fourth chart (above) looks at the ages of 63rd New York deserters, showing a concentration among those aged between 17 and 28. However, to examine any potential significance in this data it is necessary to also have information on the relative ages of all the men of the regiment, which is the purpose of the fifth chart (below). 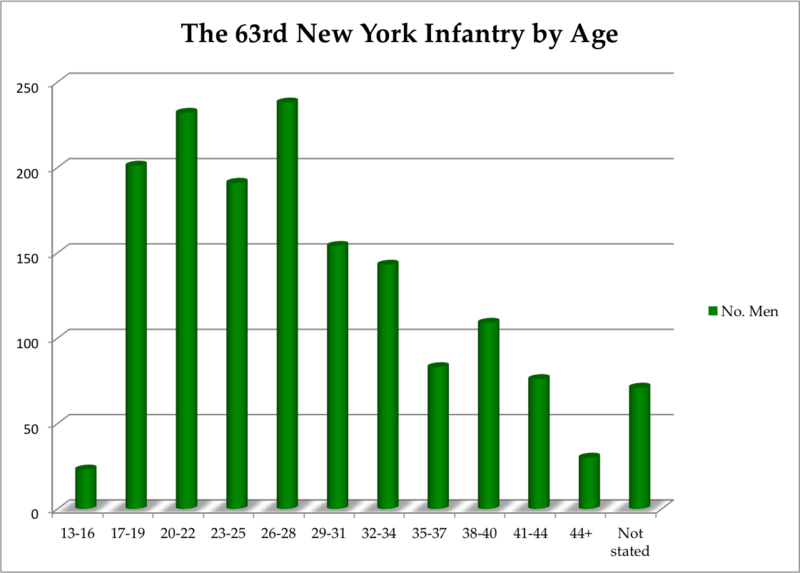 The above chart illustrates the ages of all the men who served in the 63rd New York Infantry on enlistment. This chart is of course of significant interest in and of itself; the largest age group we see for soldiers in the regiment is the 26 to 28 bracket, with the majority of soldiers who served in the 63rd during the war aged between 17 and 28. It is nonetheless of note just how many of the regiment were aged between 29 and 44. When the age range of the entire regiment is compared with the age range of those who are known to have deserted, it seems to indicate no distinctions between age-groups when it came to likelihood to desert. To further examine this, we can look at the same data expressed as percentages, as has been done below. 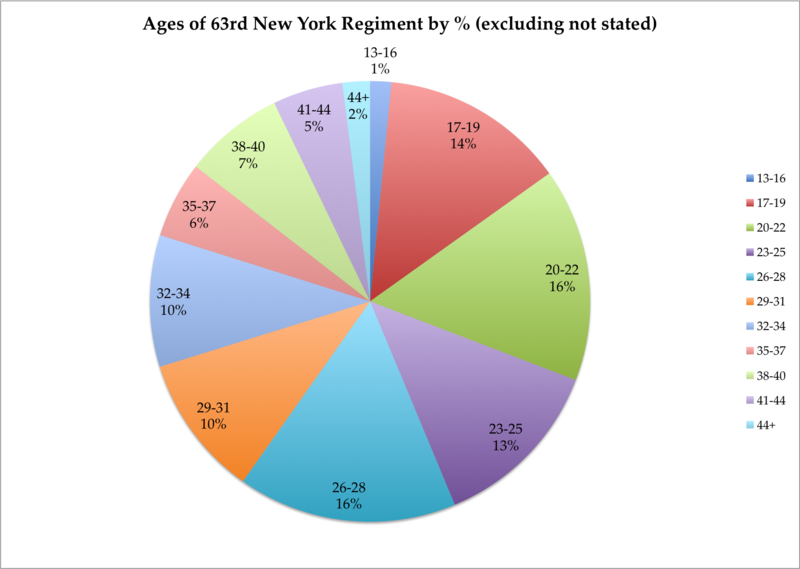 This pie chart (above) shows the ages of all the men of the 63rd New York on enlistment expressed as percentages. It excludes those for whom no age was stated in the Adjutant-General report. 59% of those for whom we have figures were aged between 17 and 28. The remainder of the regiment were over this age. 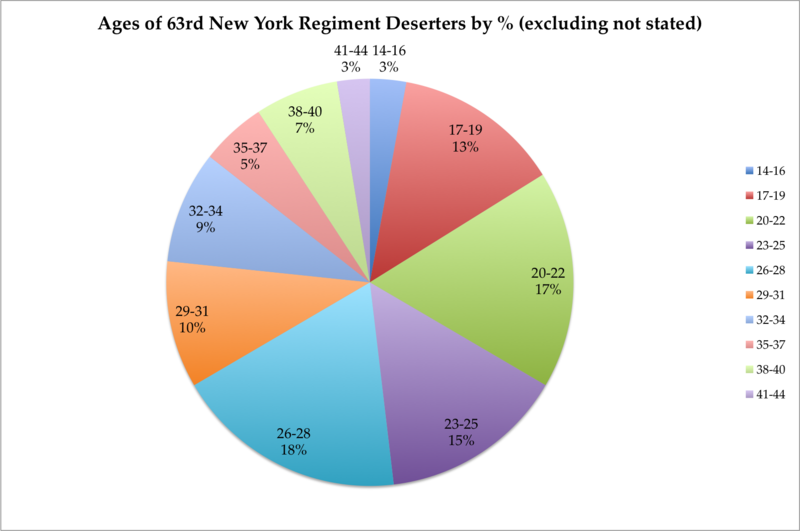 The pie chart below shows the deserter age groups as percentages (again excluding those for whom no age was stated). There is a remarkable correlation between the two, indicating that in the 63rd New York at least, age cannot be taken as an indicator of likelihood to desert, and those who were more likely to be married do not appear to have deserted at an appreciably higher rate than those who were not. Almost one in four of all the soldiers who served in the 63rd New York Regiment of the Irish Brigade deserted during the American Civil War. The next post will drill further into the data to look at some specific examples and trends, such as the desertion rates of early war volunteers when compared with those who volunteered or were drafted in later years; the men who deserted during battle and campaigns, and those who took the decision to leave having been wounded. New York Irish American 7th December 1861. Departure of the 3d Irish Regiment, 63rd N.Y.S.V. Adjutant-General 1901. Annual Report of the Adjutant-General of the State of New York for the Year 1901. Lonn, Ella 1998. Desertion During the Civil War. Very interesting analysis… particularly the age charts. I have researched only one deserter of the 63rd… Leitrim native, Patrick Short. He claimed three different ages during his service. Short was arrested in June 1864 for desertion while recovering from a wound at Philadelphia’s Mower Hospital. He violated his furlough when he stayed at home too long because of a niece’s funeral. Thanks Joe! There are a few who left following time in hospital. You have got some great detail on Short there- was there any indication for the motivations behind not returning? have several names, especially when rendered into English. Another question I have relates to age: 14-16 year old were mentioned on a chart? Was this possible or did they lie about their age? Thanks for the comment. A breakdown by county isn’t possible based on the adjutant-general reports, but it can often be partially reconstructed, though only partially. With respect to Donegal, many of the men of these units were from there. It was most certainly the war that saw more Donegal natives fighting and dying than any other in history (I have written extensively on Donegal participation, so worth checking some of the older posts on this). Remuneration was certainly a major factor for many, and was probably a driving factor for late war enlistments, i.e. late 1863 on. There were large numbers of Irish substitutes as well, and there is little doubt that many Irishmen left Ireland with the specific intention of joining the Union army for financial reasons. There was a major problem with erratic pay for servicemen, and so many states set up relief for their families, which helped to get them through periods when they were short. In terms of desertion itself, the punishment often depended. It was rare for example to be shot for desertion, though that did happen occasionally. Often they were allowed to return to the ranks with a forfeit of pay- if they were ever caught in the firstplace. With respect to loyalties, the balance of evidence suggest that loyalty to the Union didn’t take a generation or two for most of these men. Large numbers of correspondents I have looked at, who were first generation emigrants, often expressed a fervent loyalty to the Union and its preservation. They tended to refer to the United States as their country, even if they still felt a strong attachment (and responsiblity towards) Ireland. In terms of men’s names, some enlisted under an alias, particularly those who were later war enlistments. Also spelling was very fluid in a largely illiterate community. I have written about the problems one Donegal family had in claiming a pension because of the different rendering of their veteran’s name in both Irish and English. In terms of age, younger men could join up as drummers etc., but many did also lie about their age- 16 year-olds in particular would not be uncommon. The same applied to older men, who reducd their age in order to meet requirements. I appreciate your responses and your clarifications. My only quibble relates to whether “loyalties” can develop so rapidly. Being an immigrant from Ireland to Canada and then the U.S. I have difficulty believing that loyalties for the Union would develop as quickly (ie immigrant loyalties) as you maintain. That is, unless soldiers were transferring innnate loyalties from their county or country and associating them with the North or that they were superficial loyalties as a kind of expedient means. 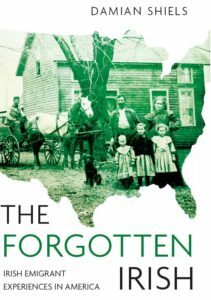 If there were 25,000 Irish born soldiers in the Confederate forces, as one source mentioned, then the Irish soldiers were transferring their loyalties to that particular region because they just happened to have migrated there. Alternatively, I would think that many Irish became West Britons when they joined the British forces but when push came to shove they reverted quickly to their county or country loyalties which were completely opposed to the British Empire. Another facet of the Civil War makes me think of the biographer of General Lee who noted that Lee’s primary loyalty was to his State of Virginia, not to the Confederacy, despite the fact that his family had lived for many generations in the Southern states. Anyhow, I would think that “loyalty” would have a lot to do with desertion rates (or going AWOL). From the correspondence I have read many of the Irish do seem to have done so. They felt they had a new start, and though they still considered themselves Irish they were committed to a new life- this is of course where they express any sentiment- many were in pursuit of economic stability. The point re State loyalties is well made though- many Irish felt loyal not just to their state but the location (e.g. the town) where they had settled. knew by chance when I met his son, Brian in Cape Breton, NS where he was singing Gaelic songs with his group “Cruinn”. I teach in Peace Studies at the University of Maine so if you ever come to Maine let me know. Thanks for your insightful, well researched, analytical, and informative posting! I know that from my own family’s genealogical research that there are many anecdotes regarding officially reported Union Army ‘desertions’ which had been reported in original source military records that make analysis and conclusions somewhat suspect today. For example, there were many fraudulent and often multiple enlistments by soldiers to acquire State sponsored ‘bounties’. I know one particular case, Pvt Kearon Hogan, Co B 30th Mass Vol Inf Regt who was seriously wounded at Cedar Creek, VA on Oct 19th 1864 but reported ‘deserted” but actually he had been evacuated to an Invalid Hospital in Washington, D.C.. He and later his family tried for years to ‘correct’ his military record at the U.S. Pension Office to no avail. Thanks so much! You are absolutely right there, not everyone had deserted who was listed as such, it is a complex topic, but a fascinating one!